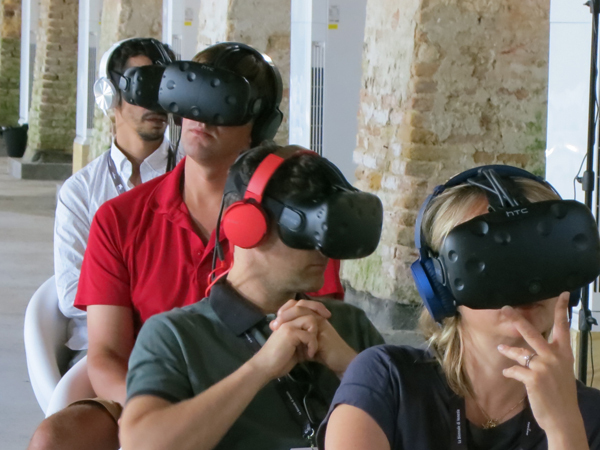 Venice 2017: Sensory Saturday; or, what puts the Virtual in VR? La Camera Insabbiata (2017) by Laurie Anderson and Hsin-chien Huang. Kristin and I are Virtual Reality novices, so when we got a chance to sample some pieces at Venice VR, we jumped. The demand was great for the 22 pieces on display, and you had to book each encounter separately in advance. The event was held on its own island, Lazzaretto Vecchio, which was startling in itself; the facility was once a hospital for plague victims. We took in four pieces in one afternoon and may go back to see some others. We didn’t see exactly the same ones, so my report and speculations are limited to mine. Apart from being fairly wild, sometimes creepy, sensory experiences, they set me thinking about how VR seems to work as a medium. My quartet was a varied assortment, each somewhat parallel to a film genre or narrative prototype. The first was Greenland Melting, by Catherine Upin, Julia Cort, Nonny de la Peña, and Raney Aronson-Rath. It’s part of a Frontline documentary series, and it follows the format, but with immersion. Presenters addressed the camera (me) and took me via helicopter to the glaciers so I could watch them heaving themselves into the sea. The camera took me underwater as well, and I experimented with voluntarily bobbing under and above the waterline; it worked. Again, as in a film, the transitions between shots was managed through quick dissolves. I first chose the sound domain, which asked me to speak. My words were not only played back to me, but then assumed vase or candy-bowl shapes of gleaming color. Getting bored with hearing myself and seeing my words made solid, I switched to flying. Flying was most excellent. Once I figured out how the remotes governed direction, speed, and angle, I could steer a swift path through, over, and around those huge black surfaces. The sense of self-initiated optical flow was powerful, although there were no other cues (e.g., balance, air pressure) to mimic actual flight. But I could have fun playing with this a long time. This was pure subjective POV cinema, or first-person gameplay if you like, and everything was one single shot. If La Camera Isabbiata put the onus on the user to initiate everything, Draw Me Close: A Memoir by Jordan Tannahill, made me respond to a situation. Once the goggles went on, I was guided to a black-and-white broken-line image of a woman on her sickbed. The artist’s voice-over presented the situation of his mother, dying of cancer, and me-as-him visiting her. Unseen by me, except as her avatar in the goggles, a performer filled the role of the mother, occasionally taking my hand and responding to my responses with more or less scripted comments. I made my way to a cartoon bed and actually sat on it. The illustrated woman spoke to me, with Tannahill’s voice-over responding. On instructions, I went outside to fetch her paper, but coming back in I moved into a flashback of Tannahill (me) as a little boy playing with Mum. She chatted with me and I feebly responded, and followed her instructions to make colored marks on paper stretched out on the floor. Later that night Tannahill’s narration guided me to a more unpleasant memory, one reminiscent of Terence Davies’ Distant Voice, Still Lives. It was a minimal narrative to match the images, but I could fill it thanks to the familiarity of the scenario and the tactility of furnishings (bed, door) and physical human contact. The Deserted, a 55-minute piece, was frankly billed as “a film by Tsai Ming-liang.” A series of fixed long-shots joined by cuts shows a typical Tsai situation: a young man and his mother live in a ruined temple. He apparently administers electrotherapy to his back and chest; he floats in his bath with a fish; it rains in buckets and water comes seeping in to where you’re hovering. A woman in white, perhaps a ghost, appears at times, once in the man’s bathtub. You make the choices in La Camera Isabbiata, and you role-play in Draw Me Close, but in The Deserted you’re locked down as a witness. 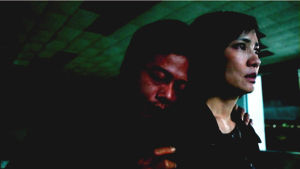 No images from the piece seem to be available, but this, from a shot of a camera monitor, roughly indicates the film’s first shot (which isn’t as distorted as this looks). You can’t move to another spot, and you can’t even crane your neck to peek around corners. You can swivel your head to look 360 degrees horizontally and vertically. But nothing much happens behind your back or over your head. All the action, such as it is, takes place squarely in front of you. 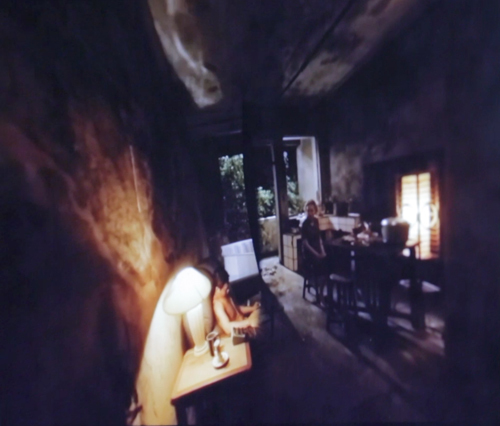 Given Tsai’s penchant for static long takes and deep areas of space, The Deserted isn’t putting you inside a real or virtual space; it’s putting you inside a Tsai film. 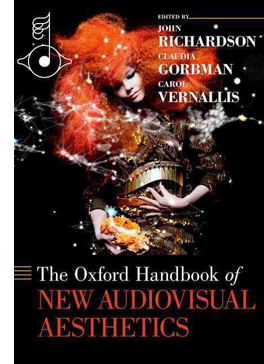 Since I’m no expert on VR, all I have are initial observations based on this sampling and on a bit of reading. First observation: VR doesn’t have to be photorealistic to engage you. The image in Draw Me Close is quite impoverished in terms of real-world cues, and the shots of The Deserted are almost shockingly fuzzy. (Tsai, a fan of razor-sharp focus, would never let them in one of his film films.) Other pieces in Venice VR, visible on monitors while users were getting the full dose, are often quite cartoonish. Why are they then so compelling? E. H. Gombrich suggested long ago that illusion can rely more on stimulation than simulation. That is, choose just a few sensory triggers and you’ll be aroused even if the image isn’t particularly lifelike. Baby geese can, if primed properly, take a box for their mothers, and frogs can snap at anything floating in a fly-ish sort of way around their heads. Outlines, it seems, are central for creatures like us, but they don’t have to be detailed. We also respond, fast and stupidly, to configurations that suggest faces. 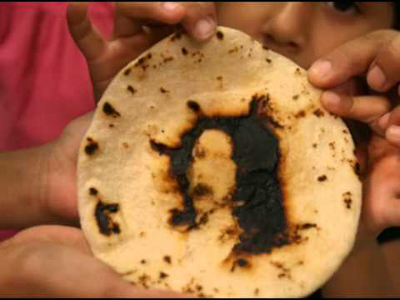 Try not to see Jesus, or Janis Joplin, in the tortilla, or a stare on the wings of a Caligo butterfly. As caricaturists and camouflagers know, a few distinctive features can suffice to summon up the target, and the same goes for the partial and degraded input we see in Draw Me Close and The Deserted. In addition, concepts play a role; our ideas about what to expect in certain surroundings, such as a household, help the illusion cohere. And the information needs to be consistent. When I turn my head in Tsai’s temple, nothing I see contradicts the other cues. A second point: The VR experiences subtract on some channels of input and compensate on others. Normally, perceptual reality is massively redundant. Our sensory systems reinforce one another. Tilting your head sends signals about balance and vision, while sight and sound and touch and muscular activity offer mutually confirming information. And when things are uncertain, you can always test your environment by moving around. But the VR systems I encountered impoverish the input on certain channels. Standing in the helicopter of Greenland Melting, I saw the passenger seat beside me as vividly three-dimensional, but when I tried to grab it for support, nothing was there. In The Deserted, I looked down and didn’t see my feet; in fact I was an eye in a bubble floating midway up the wall, where the camera was. And in neither of these pieces could I move voluntarily to poke around much in the space. I could do that in La Camera Insabbiata, but it was an impoverished environment along other parameters. I could fly, but not touch any of the surfaces–which were without color or shadow, beyond a spotlight that shifted to follow my attention (presumably guided by eye-tracking software). I couldn’t land atop one one of the monoliths, or bump into an edge. Reciprocally, Draw Me Close provided other sensory inputs: locomotion (though not wholly voluntary), touch (initiated by the performer playing Mum, and by the prop bed and door), and an array of skimpy visual-spatial cues. In principle, smell could have been included. Why not, then, go the whole hog and use a photorealistic rendering of the space and Tannahill’s mother? Perhaps a very faithful representation of Mum and the household would have raised the problem of the Uncanny Valley. Just as important, we might ask: Since a performer is always required for the piece, why not simply play out the scenes with her and the user? Just go for reality, not virtual reality. 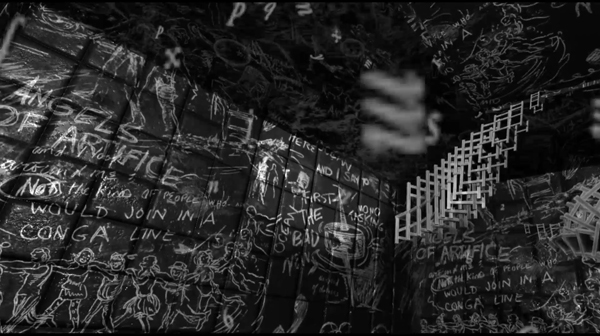 I’m guessing that the move toward drawn imagery marks the project as stylized enough to be a media artifact, rather than a piece of interactive theatre. (Though it is partly that.) Here, I’m thinking, the impoverishment of information on certain channels was a deliberate aesthetic choice, rather than being obligated by computer processing power, though that would probably have been a factor too. One of the biggest compensations for what’s missing in some channels would seem to be good old peripheral vision. This is a very strong cue to immersion, and it can override inputs that contradict it. I remember being in one of the Disney World attractions back in the 1980s, a wraparound theatre that put visitors at the center of a travelogue. Even though there were plenty of cues that you weren’t in front of Buckingham Palace–such as your awareness of people around you looking in different directions–if you concentrated on the filmed display, there was a compelling illusion that you were riding down the street toward the Palace. 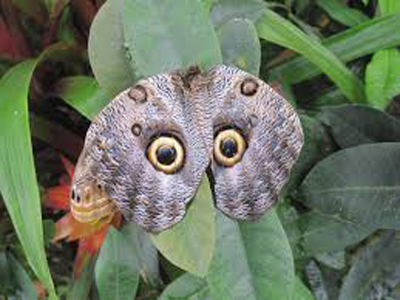 Peripheral vision would seem to be a powerful sensory trigger for creatures like us. 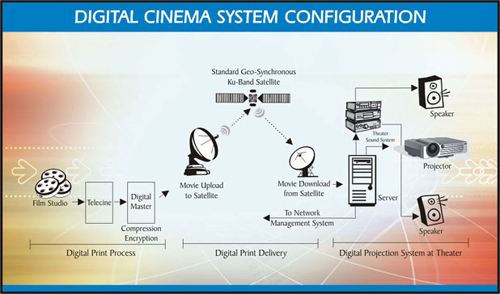 This was the insight that drove widescreen cinema and the curved screen of Cinerama. But efforts to activate peripheral vision maximally come at a cost. You lose the frame and thus a sense of significantly composed imagery. The Disney display had, as I recall, borders at top and bottom, but in modern VR those too are abolished. VR gives with one hand and takes away with the other, so to speak: Greater immersion yields less of the pictorial structuring that’s inherent in framing. 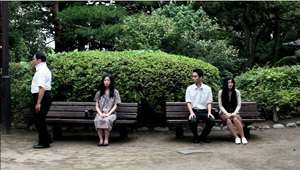 Tsai’s film somewhat overcomes this problem by making the surrounding space neutral and fairly uninformative, but the result still loses the sharp dynamic of offscreen and onscreen space we find in his feature films. One more thought, which seems more solid than the others. Some have asked whether VR can accommodate narrative. I had presumed so theoretically, but now I’m convinced. 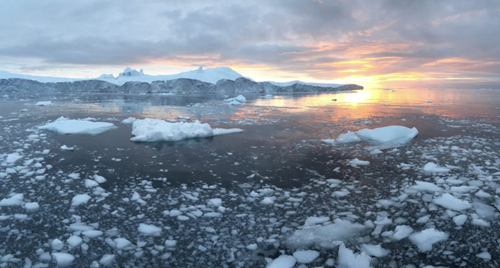 Greenland Melting told a real-world story, an alarming one at that. Draw Me Close had emotion-laden scenes, a crisis and climax, and a flashback. 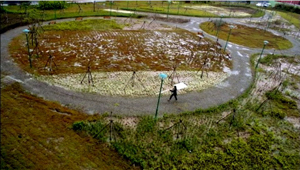 The Deserted presented a typical Tsai scenario of humid stasis–a thin narrative, but a narrative. (As often in Tsai, what we miss in psychology and causal density we get in slight spatial changes and pictorial surprises.) It wouldn’t be hard to “narrativize” the Camera Insabbiata soaring, either, say by prodding me to go on a cosmic scavenger hunt. 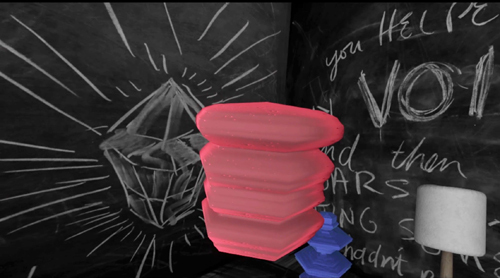 I conclude that of course VR can deal with narrative. John Landis worried that VR was too wedded to long takes to suit cinematic storytelling. That worry was in turn tied to the assumption that narratives must guide your attention. True! But it’s wrong to assume that only continuity editing can shape a film story. Our attention can be precisely guided through long takes. Indeed, to a degree the sort of open and exploratory attitude some find in VR was already there in locked-down long-take directors like Mizoguchi, Akerman, Hou, and Tsai. And they told stories, plenty of good ones. Many thanks to Peter Cowie, Alberto Barbera, Michela Lazzarin, and all of their colleagues for inviting and assisting us. Special thanks to Andrea Vesentini for guiding us through the array of events at Venice VR. For details on Venice VR, go here. Variety covers the Venice event in articles by Elsa Keslassy and Nick Vivarelli. Patrick Frater interviews Tsai on The Deserted here. I found this Wired piece a good VR primer, and Ty Burr offers an update in MIT Technology Review. Gombrich’s key essay on simulation and stimulation is “Illusion and Art,” available without illustrations here. In full form it appeats in Illusion in Nature and Art, edited by Gombrich and Richard L. Gregory (Scribners, 1973), 193-243. For discussions of how storytelling cinema guides attention within the shot, see the categories Film Technique: Staging and Tableau Staging. Better than a cellphone? Viewers at Venice VR. Where did the two-shot go? Here. Our Sunhi (Hong Sangsoo, 2013). I’ve complained here and there about the rudimentary staging of scenes in mainstream American movies. (Short version of common practice: Cut a lot and move the camera instead of moving the actors.) But just as rare as complex staging, in the age of intensified continuity cutting, is the sustained and stable two-shot. Two actors exchanging lines in a continuous, unmoving take was one building block of mature sound cinema. 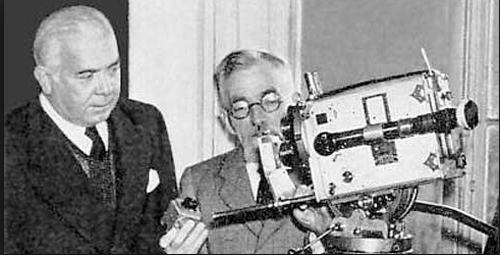 Today’s directors almost never resort to it. Their face-offs are “given energy” by a drifting or arcing camera, or lots of cuts, or, if they feel like moving the actors around, the Steadicam walk-and-talk. But the prolonged, balanced two-shot can yield remarkable results. 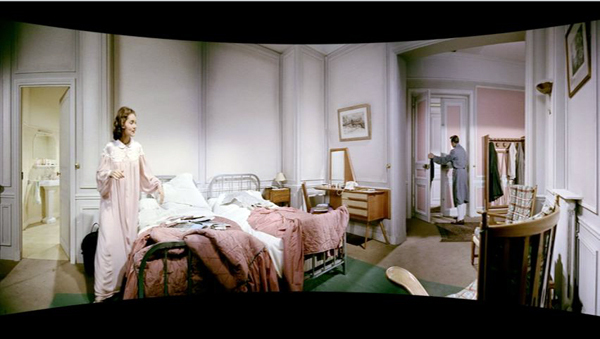 A medium-shot or medium-long-shot framing can work to a human dimension, giving prominence to the actors’ bodies. It doesn’t let their surroundings swamp them, and it doesn’t reduce them merely to faces. It lets the actors act with not just facial expression but with their posture and their upper bodies. And it nicely balances dialogue with the flow of pictorial information. 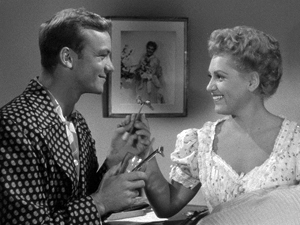 We can watch both actors, with one reacting to the other, as in The Marrying Kind (1951). Sometimes the two-shot is played with the faces in profile, as in early sound pictures like The Criminal Code (1931). But directors quickly understood that if you prefer, you can angle the actors so that we get a 3/4 view of one or both. The tactic sacrifices realism (who stands in such ways in real life?) but it’s a piece of artifice we gladly accept. It’s visible in my Marrying Kind example, as well as here in Two Weeks Notice (2002). Of course two-shots are still with us, but they usually serve to set up passages of shot/ reverse-shot cutting. The sustained two-shot carrying long stretches of dialogue is increasingly rare in Hollywood cinema. It surfaces more often, I think, in indie works (Jarmusch, Linklater, and Hartley, for instance), European films (Garrel, for instance), and perhaps most notably some Asian films. 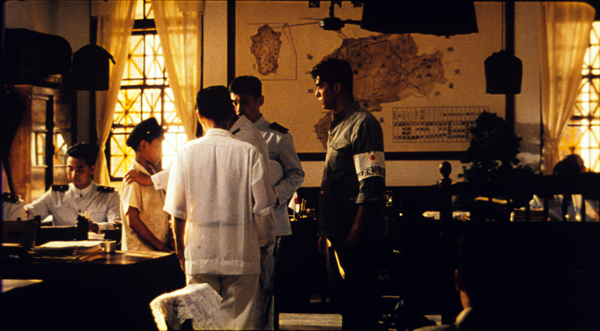 For reasons not yet well understood, during the 1980s stylistically ambitious directors in Japan, Taiwan, and China began building scenes out of long, static takes. Sometimes those are distant framings, unfolding in elaborate blocking; to my mind Hou Hsiao-hsien is the great master of this. But no less prominent are those films that present simply staged shots of two or more characters in which action and reaction are captured by a fixed camera. Often these shots avoid 3/4 views. 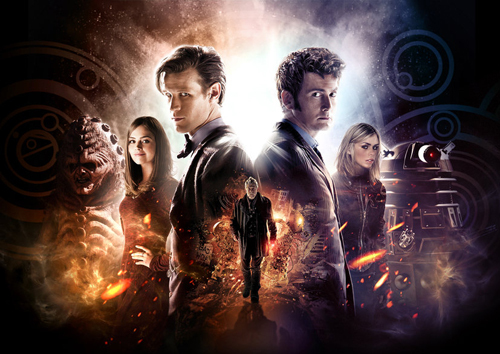 That is, we may get two characters in profile, or two characters facing the camera directly. The result is a more abstract, even ceremonial look and feel. I was remembering this tendency while watching several of the films on display here at the Vancouver International Film Festival. I saw one film very largely made of two-shots. I saw a couple in which the two-shots serve mostly as points of punctuation, breathing space between scenes that are cut up in more orthodox ways. And I saw one film that climaxed in a two-shot showing the actors holding their ground for about fourteen minutes. All were from Asia. Both visual and plot-based information follows; in other words, as often happens hereabouts, there are spoilers. Kids Return: The Reunion, directed by Shimizu Hiroshi, is a sequel to Kitano Takeshi’s 1996 film. The disaffected high-school buddies Shinji and Masaru were last seen riding a bike and declaring that they would show the world what they’ve got. Now, many years later, they haven’t shown much. Masaru is a low-level gangster who has lost the use of his left arm in a jailhouse brawl. Shinji holds a boring job as a security guard, and he’s about to give up boxing. The two meet by accident and resume a more distant version of their friendship. Masaru gets more deeply embroiled in the yakuza world, but he does convince Shinji to stick with prizefighting. As Shinji struggles to improve his skill, Masaru sets out to avenge his betrayed boss, with murderous results. The new version doesn’t have the dry, laconic quality of Kids Return, and the film doesn’t employ Kitano’s characteristic planimetric framing and compass-point editing. But the incessant over-the-shoulder framings of most movies are avoided; when we cut to a character, he or she is usually isolated in the frame. 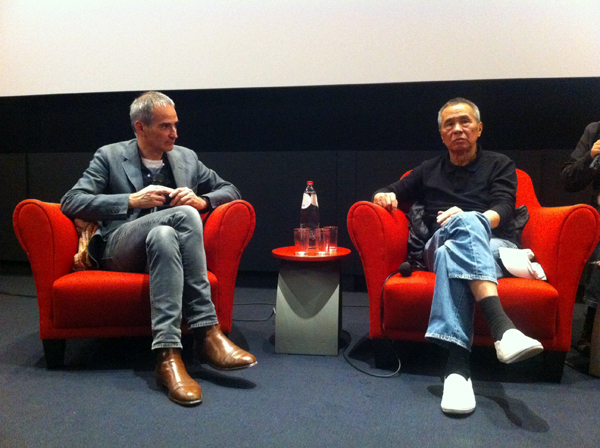 And some moments recall the cartoon-panel cutting of Kitano. One scene shifts from the yakuza boss, Masaru, and the thug Yuji in a coffee shop to a soundless shot of their young subordinate at the office simply staring off into space. 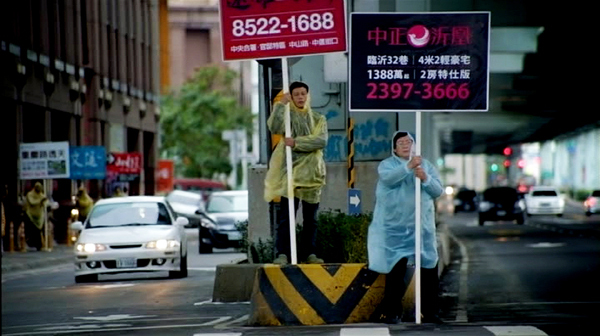 Cut to the three men strolling back to the office, with Yuji commenting that the kid never keeps the sidewalk clean. A pan following the men into their building shows the office open and men inside. 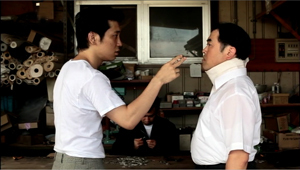 Yuji bolts past his boss and flings himself at a policeman, who is one of several ransacking the place for evidence. Most directors wouldn’t include the enigmatic shot of the functionary, but it yields a little question–what is he reacting to?–that the next shots gradually answer. So cutting plays an important part in building up many scenes. But occasionally Shimizu pauses to draw a moment out. When Murasu and Shinji meet after many years, a nearly thirty-second shot squares them off. Instead of embracing and pounding each other’s back in the American fashion, they stand awkwardly opposite each other, and the anamorphic widescreen image stresses the tentativeness of their reunion. Later, when Murasu’s boss suggests he leave town and work for another boss, a poised two-shot (at the top of this section) lets us watch the interplay between them across two minutes. Again, the ‘Scope ratio helps, and the fixed frame adds a comic touch by setting at frame center the hideous, ticking clock that Yuji has bought the boss. I don’t want to suggest that there’s anything particularly radical about Shimizu’s two-shots. Kids Return: The Reunion simply reminds us that a two-shot can usefully vary the film’s pace and lend gravity to moments of character reflection. Something stranger goes on in Anatomy of a Paperclip, the winner of the Dragons and Tigers Award here at VIFF. The story is an exercise in grotesque nonsense, a sort of Japanese Theatre of the Absurd. In an undefined town outside time (no cars, videos, or cellphones), a harsh boss rules over a crude cottage industry. Three, sometimes four, workers sit along a bench and make paper clips by snipping and twisting wire. The most hapless is Kogure, a lumpish loser wearing a neck brace. Bullied by two outlaws who constantly make him surrender his money and take off his clothes, eating with painstaking regularity in the same cheap restaurant, he returns home every night to sleep. A butterfly visits him and apparently leaves a pupa behind. As Kogure trudges through his days of petty humiliations, the pupa swells to human size, even bigger than the pods in Invasion of the Body Snatchers. Director Ikeda Akira shot the film in fifteen days over weekends and holidays. It’s partly in the planimetric mode, with the camera lined up perpendicular to a back wall or lines in the setting. Even more than Kids Return, the mug-shot and police-lineup staging recall linear, minimalist manga. A great deal of the film’s feel, that of a frozen, almost robotic world, derives from this deliberately “flat” look. In Anatomy of a Paperclip, the profiled two-shot functions as part of the overall visual pattern. 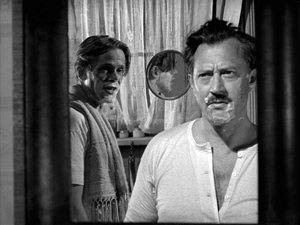 Although some conversations show 3/4 views of the characters, and even yield occasional OTS (over-the-shoulder) framings, many two-shots preserve the geometrical right angles of the master shots. Another function of our two-shot, then: To play its part in a film’s overall pictorial design, suggesting expressive qualities like rigidity, automatism, and deadpan humor. 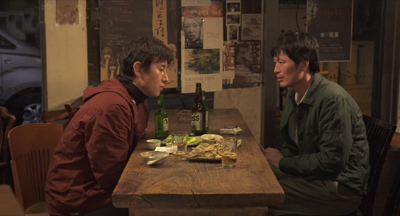 Hong Sangsoo has made the two-shot–usually profiled and showing characters drinking heavily at a restaurant table–into a central formal device. His films are conversation-driven, and he has rung an ingenious series of variations on duologues. They are typically presented in ways that stress similarities and contrasts among characters, often to mildly satiric effect. We see A and B in one setting, then perhaps B and C in another setting, then A and C in the first setting, and so on. For examples, see this entry. In the more formally complex Hong films, these variants may be played out as intermingled points of view (The Power of Kangwon Province) or as alternative versions of the same events (The Virgin Stripped Bare by Her Bachelors) or just weird déja-vu (Turning Gate). In an earlier entry, I suggested that Hong exploits our inability to remember certain things precisely, so that we may forget when we first heard a recurring line of dialogue or saw a shot that is echoed by the shot we’re now seeing. Our Sunhi is about a hugely momentous event that hasn’t, to my knowledge, been dramatized on film before: a professor writing a grad-school recommendation. Sunhi approaches Professor Choi for a reference that will help her study in the States. As she coaxes him into revising his initially cool letter, he becomes attracted to her, as does another university employee Jaehak. Meanwhile Sunhi meets her old lover Munsu, and he becomes attracted to her all over again. Here the formal rondelay that mocks male vanity–a Hong specialty–doesn’t involve fancy tricks with time or parallel viewpoints.Instead, what circulates are comments about Sunhi, pulled from the professor’s letter (“She has artistic sense,” “She’s honest and brave”) and passed from man to man. The points of circulation come in eleven duologues, each shot in one or two symmetrical long takes. Sunhi meets Jaehak, then Choi, then Jaehak again, then Munsu. Soon Munsu is going out drinking with Jaehak, with whom the prof has coffee before having a rendezvous with Sunhi. Connecting these nodal scenes are brief shots of characters walking through streets, meeting one another by accident, and at the finale, converging in a palace park. As you’d expect, these connecting bits are typically made parallel to each other through framing, situation, music, or other devices. The two-shots are very long; the longest runs over eleven minutes. It presents a sort of climax, in which a drunken Sunhi reaches out to clutch Jaehak–a gesture of greater intimacy than she has shown any other man. But soon enough she is meeting the professor for a date in the park. In the very last scene, when she goes off to the toilet, Hong gives us a tiny joke. All three of the men finally meet, waiting for her, and at last a two-shot becomes a three-shot. This sheerly formal gag is pretty esoteric, I grant you, but it’s typical of Hong’s urge to tweak the simplest materials. In his hands, the lowly two-shot becomes a structuring constraint, a way of deliberately limiting his choices to show us what he can do with it–not least, comic variation. Two heads, better than one? During the 1940s, directors in various countries began to rethink the layout of their two-shots. Instead of giving us matching profiled or 3/4 views, they began to arrange their players so that one figure was significantly closer to the camera, yielding what I’ve called a big-foreground composition. 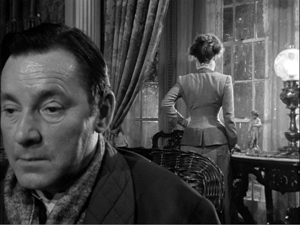 In America, the most flamboyant early versions came from Orson Welles (Citizen Kane and The Magnificent Ambersons) and William Wyler (The Little Foxes, below). This strategy encouraged staging in depth and even letting players turn their backs to one another. Tsai Ming-liang’s Stray Dogs is the most elliptical and visually variegated film of this VIFF bunch. It’s less a story than a situation: A father, mother, and two children try to survive on the streets. The father picks up odd jobs, while the mother finds work in a supermarket. They wash in public restrooms and scrounge castoff food, sometimes thanks to the mother’s rescuing market goods past their sell-by date. At night, the father and the kids huddle in a makeshift hut, until the mother finds a somewhat better squat in a ruined office building. 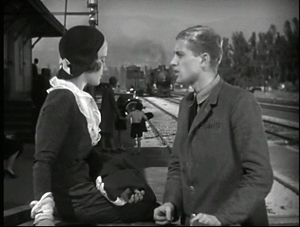 Every scene except one consists of a single take, but the connections between scenes are far more oblique than in the other films in this entry. For instance, the mother is seen weeping beside her sleeping children in the opening shot, but then she vanishes from the plot for a while before reappearing in the supermarket, now with her hair cut shorter. The clear and continuous duration of the scenes is offset by a narrative organization that skips over a lot of time and refuses to explain everything that happens in the interim. Tsai’s visual strategies are quite diverse. Unlike Hong Sangsoo and others in this trend, he doesn’t always keep his camera within a mid-range zone. 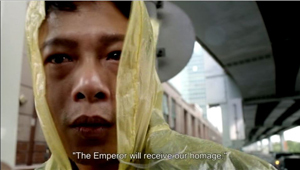 A scene’s single take can be a striking extreme long-shot or a tight close-up, often of the father (played by the still remarkably waif-like Lee kang-sheng) eating, drinking, or just reciting a poem. Stray Dogs makes little use of two-shots, and his “clothesline” layouts aren’t quite as frieze-like as those in Anatomy of a Paper Clip. He saves his devastating two-shot for what is, in this quiet and melancholy drama, as close as we get to an intimate climax. The image at the top of this section shows the husband and wife, her face looming in the foreground while he stands behind her. Why is this shot, only three minutes longer than one in Our Sunhi, so fiercely hard to take? Hong Sangsoo fills his restaurant shot with gab and plot development. Tsai’s shot, reminiscent of the big-foreground compositions of Welles and Wyler and many afterward, is almost completely unchanging. Neither husband nor wife speaks for fourteen minutes; the only action we see in most of the shot consists of him occasionally swigging alcohol from the bottles he’s stolen and some tears running down her cheek. And we have no idea of when the shot will end because there’s no obvious trajectory set up for it. Like the fixed close-up of a weeping face that ends Tsai’s Vive l’amour, this shot could go on forever. About thirteen minutes in, the husband grasps his wife’s shoulders and leans his head wearily against her neck. 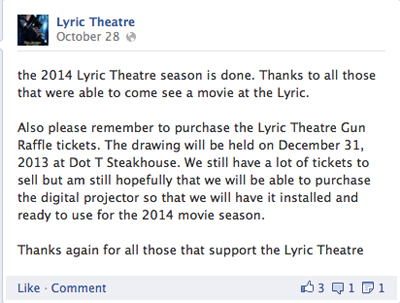 In a context scoured of what we normally think of as drama, such tiny movements become major events. The father seems at once apologizing for his drinking and trying for a reconciliation. Tsai has reserved his two-shot for his climax. 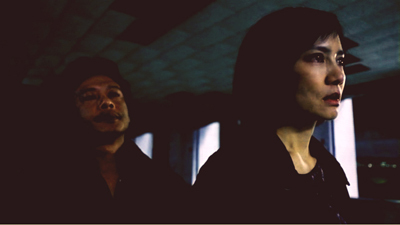 Instead of becoming a resource judiciously salted through the film (Kids Return: The Reunion) or a stylized extension of a cartoonish world (Anatomy of a Paper Clip) or a core schema for the film’s visual design (Our Sunhi), the two-shot here, rendered as an aggressive image of faces close to the camera, becomes the marker of a mysterious turning point in two lives. All the films are very much worth seeing for their own reasons. Treating them together, though, reminded me of the power lurking within one very basic cinematic resource. Last year I considered long-take shooting and staging techniques in that edition of Dragons and Tigers, with comments on Tsai Ming-liang’s Walker. Just in case this occurred to you: No, Wes Anderson didn’t invent these techniques. This entry and some others explain. For more on varieties of staging, see On the History of Film Style and Figures Traced in Light: On Cinematic Staging. 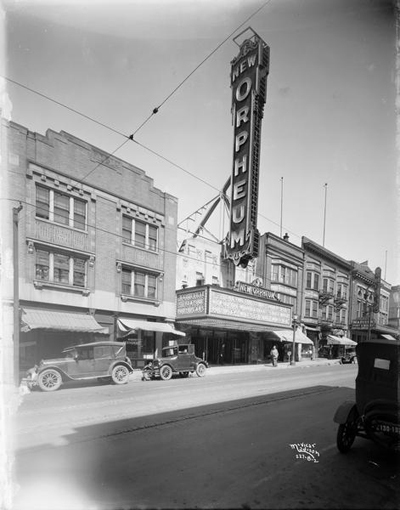 On this site, you can visit the supplement to Figures here, and the categories Film Technique: Staging and Tableau Staging.